Today I am going to describe how to edit title and modification date. With the development of the modern society, more and more office workers broadly use pdf files in their daily work than before. Sometimes they need to edit title and modification date for the needs of the work. 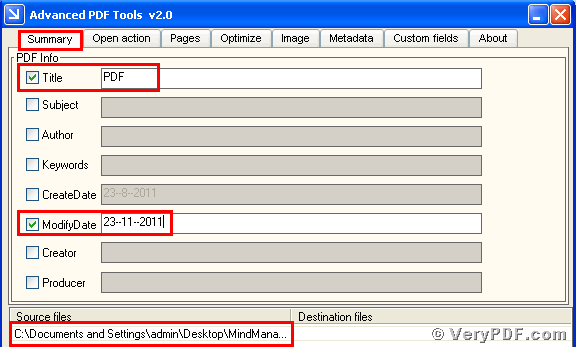 As we all known that the format pdf files can not modified without any Tools. In order to meet the needs of the office workers, the verypdf.com.Inc develop a software the Advanced PDF Tools, which can solve all kind of pdf files. You can modify the elements of the pdf. Therefore this software is so useful, why not to know it? If you are interested in the functions of this software, you can go to this website: http://www.verypdf.com and read more articles about it. Right now, let go to the straight. So please pay attention to my steps, hope you can gradually master this functions. It will take two or three minutes for you to read this article. You need to be patient for it. Install this executable file in your computer. Register this software. What you need to do is that input the codes in it, of course the codes enclosed in this software. Double click the label page “Summary”, and check the boxes “Title” ,“Modify Date”. And then input the information in the matched light bar. Then save the change. Please look at picture1. 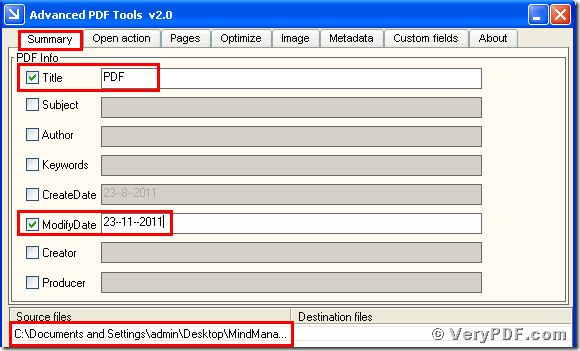 Open the before changing pdf file and the after changing pdf file, you will find that we had already changed the title into “PDF”, and changed the modify Date into “23-11-2011”. That’s interesting. You see it is very simple and easy to operate it. You can experience by yourself and enjoy it. Thanks for your reading. How to compress PDF files? This entry was posted in Advanced PDF Tools and tagged Advanced PDF Tools, edit title, modification date. Bookmark the permalink.